There are few towns in Hungary like this, where so many legends and sights can be found from the time of the Turkish occupation. 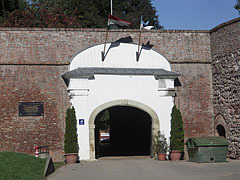 Szigetvár became famous during the Turkish siege when Miklós Zrínyi, instead of surrendering the castle, made a sally and attacked the superior enemy force although they knew they had no chance of survival. Besides the castle there are other things to see here, for example the inner city, the spa and cultural events which will encourage visitors to lengthen their stay. At the time of the Celts and Romans a fortification stood on the marshy area. 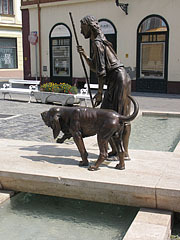 During the period of the Hungarian conquest the tribe of Botond settled down here. By the 15th century the settlement developed into a medieval town, which was enclosed by water and fortified walls. The history of the city is strongly connected to its castle. In 1526 the city was fortified during the Turkish attacks by damming up the Almás Stream. The Turks were able to seize the castle in 1566 after several attempts in spite of Zrínyi’s heroic deed. 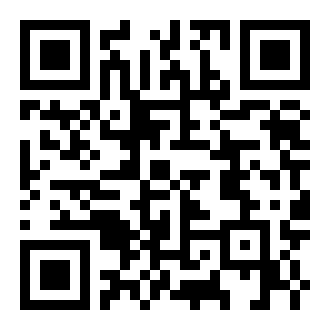 It was only in 1689 that it was re-captured. During the Turkish occupation the Hungarians were driven away, and then Turks and Bosnians settled down in their place. Historically it is the most well-known castle in Hungary. It was built on an artificial island at the beginning of the 15th century. A bridge used to connect the castle and another market town on another island which was formed by damming up the stream. 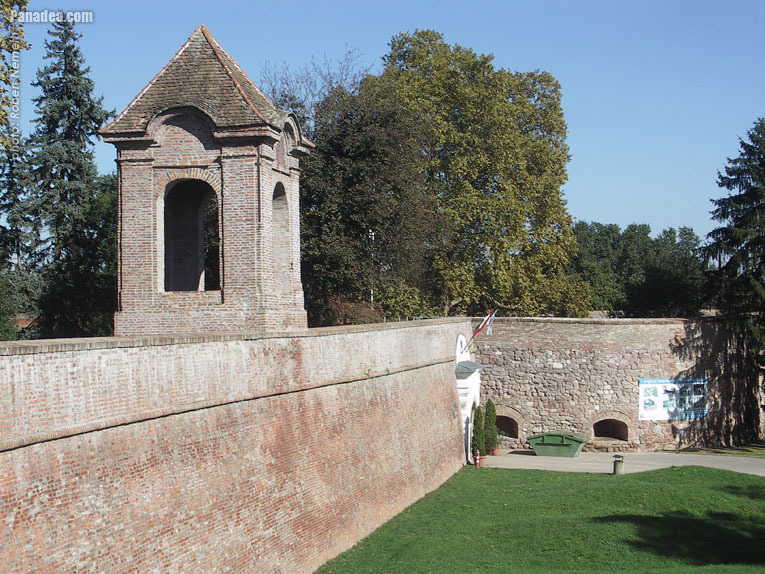 The city was also protected with a fortified wall. On hearing the news of the Turkish approach in 1526, the castle was fortified and passed on to the king. He provided the castle with a permanent guard and famous soldiers protected it from Turkish attacks. Unfortunately they managed to seize the castle in 1566, when it was defended by Commander Miklós Zrínyi. His small army of Hungarians and Croatians defended the castle heroically for a month against the superior forces. When the castle was already burning he did not surrender but leading his men stormed out to face the Turks and certain death. His great-grand son recorded the siege in his epic called “Szigeti veszedelem”. 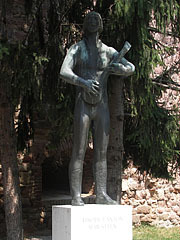 In front of the entrance to the castle you can see the statue of Sebestyén Tinódi Lantos. He was the famous minstrel of the Hungarian renaissance and with his fables he informed the aristocracy about the events happening in the country. The present castle is not like the original one, since that was destroyed after the siege of 1566. 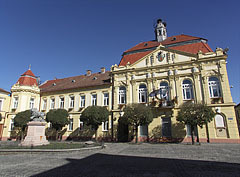 The Zrínyi Miklós Museum is located in the present Andrássy castle and the mosque of the sultan, Suleiman, attached to it. Miklós Zrínyi has a separate memorial room in the museum. According to some legends Suleiman sent a message to Miklós Zrínyi that if he married his daughter off to him, then he would march away from the castle. Zrínyi accepted this offer, and then in the evening his daughter rode out of the castle to Suleiman’s tent and shot him with arrows. She returned to the castle safe and sound. Although the arrows missed their target, the canons of the castle did not. The Turkish vice commander concealed the death of the sultan from the soldiers; he clothed him and sat him on his throne. He made the soldiers start to fight and they seized the castle. When the Turks reached the inner castle, Zrínyi’s daughter exploded barrels of gunpowder, so not only her but several Turkish soldiers died also. Another story says that when Zrínyi was preparing to run out of the castle, the married soldiers went to the chapel to say farewell to their wives. They then stabbed them to death in order to avoid them becoming captives of the Turks. One of the women did not choose this solution, but put on men’s clothes and fought alongside her husband against the Turks. Both of them died on the battlefield. 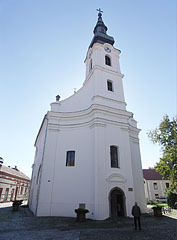 The Roman Catholic Church on Zrínyi Square was built in 1788 and it is consecrated to St Rókus. It is the reconstruction of the Ai pasha mosque of 1589. The tomb of the pasha was pulled down and the building was extended, but its two minarets still exist. Walking in the direction of the castle from the square you will find the neo-classical Sóház at the beginning of Vár Street This house used to serve as a stagecoach station, but now it is a café and holds an exhibition on local history. This house dates back to the times of the Turkish occupation; it represents the typical 16th century Turkish building style using bricks. It is a rarity in Europe since it retained its original Turkish features. It used to function as a caravan seraglio, that is, as an accommodation for travellers. 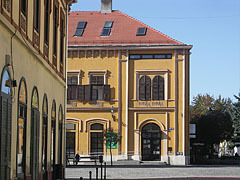 A museum is located in the rooms, where a permanent exhibition awaits tourists: ‘Szigetvár in the Turkish era’. At the entrance of the park the huge statues of Suleiman II and Miklós Zrínyi greet visitors. This park is the symbolic grave of Suleiman, who died in Szigetvár during the siege of 1566. His large tent stood in this park at those times. Turkish leaders buried his body inside the tent in order to conceal his death. The original mosque of the sultan stood on the site of the neighbouring Baroque church. His internal organs are buried here, but his embalmed body was transported to Istanbul and put in the ornamental Türbé (tomb) of the mosque named after him. The embalmed body of Suleiman II was carried to Istanbul, but his internal organs are buried in Turbék. His son, Selim II erected a marble tomb above the grave. 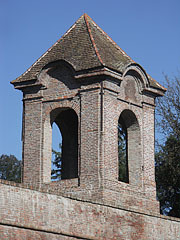 On this site, at a later date, a Catholic wooden chapel was built. To look after this shrine a Franciscan hermit settled here. He was followed by several others as well who lived in the hermitage behind the chapel. This shrine is one of the most important Turkish holy places and is also the destination of Catholic pilgrimages.